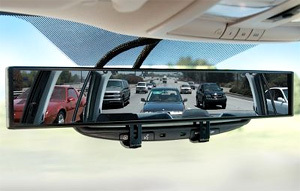 Extra Wide Rear View Mirror Eliminates Blind Spots | OhGizmo! Your standard rear-view mirror only gives you about a 52 degree field of view, which is fine for seeing what’s behind your vehicle, but not what’s next to it. On the other hand this extra wide rear-view mirror, which is apparently used by police officers and racecar drivers expands your field of view to 180 degrees. That means you can see all the traffic that’s behind and adjacent to your vehicle across a 5 lane highway. In fact any vehicles that are alongside and attempting to pass your car will be visible in the mirror until they enter your peripheral vision, effectively eliminating your blind spot. The mirror also reduces headlight glare by 50% and can easily be retrofitted to your existing rear-view mirror using a set of included clamps. It’s available from Hammacher Schlemmer for $59.95. Excuse me, but, who’s driving that car? I have one like that, but I think mine’s different. It’s made by broadway. It has a blue tint to eliminate glare. You can get them in flat or convex, but the convex allows you to see more, I believe. It was about 15 bucks. I don’t know why this one is 60. How wide is this thing and can one still use the sunshield visor?